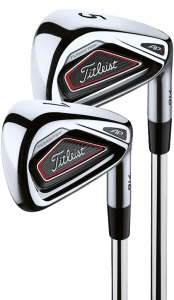 The much anticipated release of the Titleist 716 range, available OCT 23. Titleist have a very clear direction when it comes to iron design says Dan Stone, Vice President of Research and Development Acushnet Titleist. Titleist irons have traditionally been the choice of highly skilled players who favor shot-shaping and control over pure distance and forgiveness. The iconic clubmaker’s 2016 stable still caters to Tour pros and club champs, but its newest sticks—both the better-player offerings and the ones for average Joes—pack a heap of help into their compact designs. The company uses several cool technologies, including high-density tungsten, to improve launch, forgiveness and distance without compromising Titleist’s hallmark look, feel or control. So lets introduce you to Titleist’s largest iron release. Pros: A serious distance upgrade. The 716 AP1 irons have thin, unsupported club faces that make them a challenger in the distance category. The addition of 50 percent more tungsten allowed engineers to keep the size of the irons the same, yet make them more forgiving than their predecessors. Cons: The PW has an unusually strong stock loft of 43 degrees. Golfers will most likely need to use an AP1 “W” wedge (47 degrees) or another specialty wedge to maintain consistent yardage gaps. Who they’re for: They’re designed for golfers looking for maximum distance and forgiveness, but anyone can play the 716 AP1 irons. Those interested in Titleist’s players irons may want to consider AP1 long irons as part of a mixed set.